Description: Helen Booth was my 9th Grade Home Room teacher at Watkinsville OCHS in '54-55. She taught science and chemistry. She retired in 1975. She was a very good and friendly teacher. She also helped her husband, Jim, run Booth's Sundries on the Courthouse Square in Watkinsville, particularly after her retirement. She was active in community affairs for many years. Watkinsville, Georgia - Helen Parr Mallard Booth, of Watkinsville, died November 27, 2004. Born in Clarke County, she was the daughter of the late Emory and Ina Lanier Parr. She was preceded in death by her first husband, John Clyde Mallard and second husband, Jim Booth. 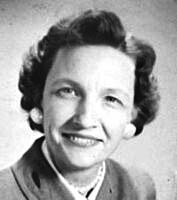 Mrs. Booth was a graduate of the University of Georgia and was a retired teacher from Oconee County High School. She was a member of the Georgia Retired Educators Association and was elected to the Wall of Fame for Oconee County Educators. She was a member of the Oconee County Homemakers Club and Watkinsville First Christian Church, where she served as deacon emeritus. Funeral services were held Monday, November 29, 2004 at 11:00 AM at Lord and Stephens Chapel, WEST with Revs. Patrick Chandler, Brent Reynolds and Dr. Franklin Shumake officiating. Interment was in Evergreen Memorial Park. Survivors include 2 daughters, Beverly Mallard Thomas (Cliff) of Douglas, GA and Marsha Mallard Lee (Russell) of Watkinsville; 5 grandchildren, Olivia Durden (Russell), Angelia Rucker (Brent), Bill Thomas, PhD (Stephanie), Brad Lee (Vita) and Kevin Lee (Nancy); 10 great grandchildren and 1 great-great grandchild. Flowers are optional. Memorials may be made to Watkinsville First Christian Church.